As of January 1st, 2014, the sale of recreational marijuana to anyone 21 and above is legal in Colorado. Now that recreational marijuana is legal in Colorado, a handful of medical marijuana (MMJ) dispensaries now sell recreational pot to Colorado residents that don't have a MMJ license (AKA Red Card). If you're coming to Colorado from out of town to experience the legal weed scene you're not alone. Thousands are flocking to the state to buy weed at one of the hundreds of recreational marijuana shops now open for business in the state. The map below should be useful for marijuana tourists traveling to Colorado. 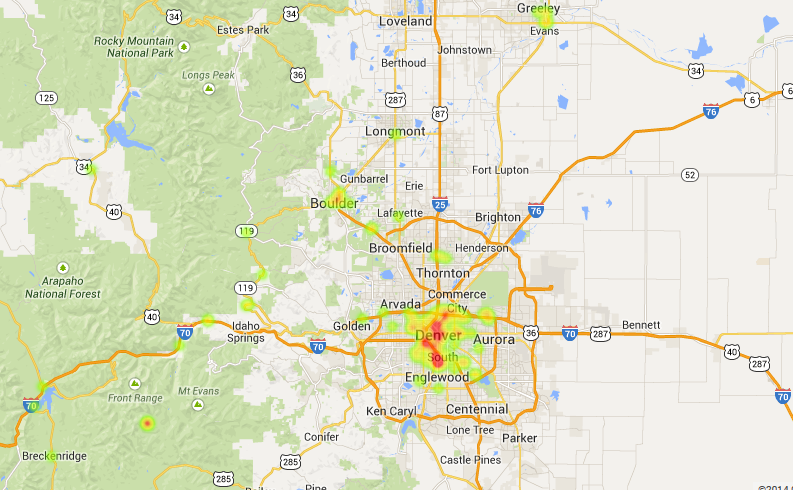 It pinpoints the location of ever marijuana dispensary that is licensed to sell legal recreational pot in Colorado. Below is a complete list of licensed recreational marijuana dispensaries in Colorado (updated June 3rd, 2014) No need for a Red Card to get weed from any of these Mile High dispensaries - you just need to be over the age of 21 and have a valid ID. Colorado residents (age 21 and above) with a medical marijuana license (AKA Red Card) can legally purchase pot from the Denver marijuana dispensaries above. Those with a MMJ card are better off using when buying weed. By using a MMJ card Colorado medical marijuana patients can avoid paying the 30% tax hike on recreational marijuana and can purchase pot from any dispensary in the state. If you have your Red Card checkout the medical MMJ dispensaries.